When it comes time to pack your bags and (sadly) leave Orange Beach, you are going to want a souvenir to take with you. 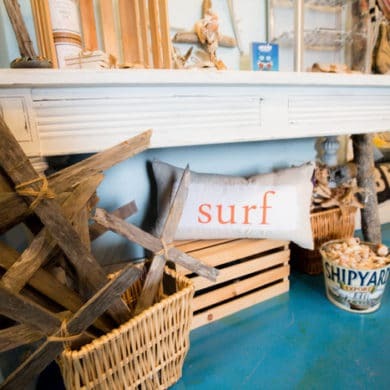 But why settle for kitsch you will never use when you could go to Salt Coastal Outfitters? Back in the 1950’s, the building that Salt now occupies used to be a Sunnyland Motel. Has it changed? Not completely! You might find yourself shopping for gifts and collectibles in an old motel kitchen — we’re not sure on what the rules are for firing up the stove. Jon, one of the Owners of Salt, talked to us about what else is setting them apart from the competition. And local is the name of the game. If it’s at Salt, there’s a good chance that it was made right here in Alabama. Jon told us about how something in the store that is more than just locally sourced. Salt has become popular with the locals and tourists. According to Jon, keeping people coming back is all about the basics. “Sometimes it’s as easy greeting people as soon as they walk in,” he says. But Jon isn’t forgetting about saying goodbye. He has a catchphrase that he thinks is sticking. “I always tell people to ‘stay salty’ as they leave,” he says. Being salty is definitely a good thing around here, so make sure you stop by Salt! Salt Coastal Outfitters is located at 25122 Perdido Beach Blvd. Orange Beach, AL. For more information, visit the Salt Coastal Outfitters Facebook page or call (251)215-9454.